Ekiti Future Summit & Awards (EFUSA) is the State’s premier event that annually gathers the most influential players from all sectors within and outside the state for two days of networking, learning, exhibition and rewarding. The main aim of this event is to broadcast Ekiti State’s investment promotion messages to potential investors. The primary aim of the event is to attract Investors and bring sustainable investors to the state, work with startups, business owners, Entrepreneur and large investors, and provide information about investment opportunities, support for accessing land, local suppliers and other essential inputs and navigating the bureaucratic steps involved in launching a successful business in Ekiti and Nigeria at large. This initiative is led by The PR Africa – A first class public relations firm. Ekiti Future Summit will focus on the need for the state to become more innovative and use innovation to drive sustainable development. This Summit will help Ekiti embrace innovation and move in the direction of digital transformation through the use of Emerging Technologies and Trends, Research, Development, Commercialization, Entrepreneurship and Investments as the key drivers of an innovation ecosystem. This platform will create awareness on the need for open Innovation in the State, and challenges it to leverage on innovation to attract investors to become more competitive in the global economy. 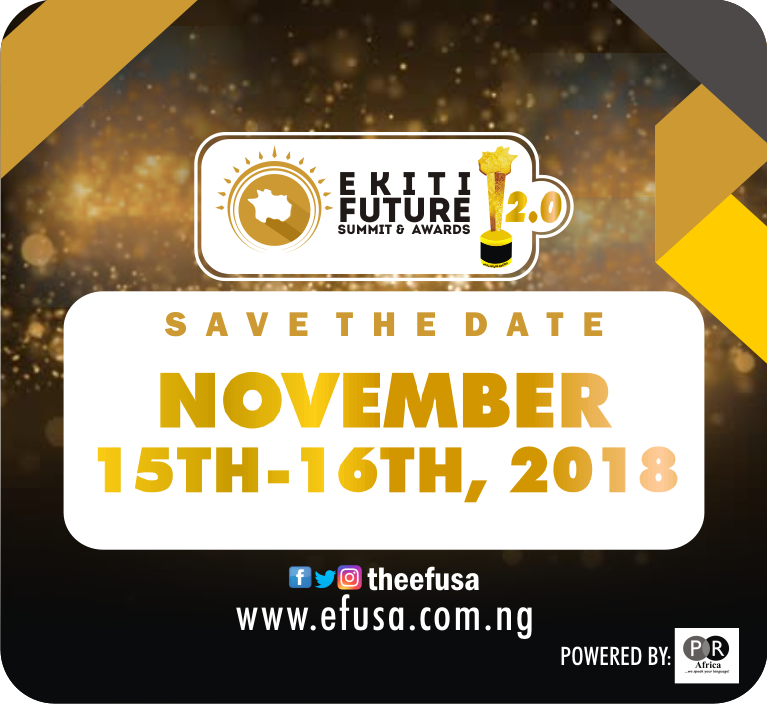 The Ekiti Future Awards is another feature of the event, which was born out of passion to celebrate and reward authentic young individuals doing well in their chosen profession and career, role models, mentors, and legends of today, yesterday and tomorrow that has spring up from and within Ekiti State – “The fountain of Knowledge and Land of Honour”. People that should attend include: Stakeholders, Investors, Business Owners, Start-ups, Entrepreneurs, Government workers, Developers and students. The event will hold for 2 days with 16 discussion panelist, 3 keynote speakers and 4 panel sessions. (First day will be for the summit/conference while the second day is for the award recognition). The Summit is totally free for anyone to attend and we encourage you all to register. For seat reservation, kindly visit our website www.efusa.com.ng and register. Seasoned speakers and panelists will be encouraged to discuss and share their unedited, undiluted ideas on how to draw investors to the state in various sessions. 1. Ekiti Future Award Price for Most Enterprising Student (Male)"
2. Ekiti Future Award Price for Most Enterprising Student (Female)"
3. Award Prize for Model of the Year(Male or Female)"
4. Ekiti Future Award Prize for Sports"
5. Ekiti Future Award Prize for NYSC"
6. Medical Student of the Year"
7. Artist of the Year"
8. Ekiti Future Award Prize for Advocacy (Student)"
9. Ekiti Future Award Prize for Fashion"
10. Campus Journalist/PR of the Year"
11. Ekiti Future Award Price for Student Poet of the Year." 12. Outstanding Student of the Year." 15. Ekiti Future Award Prize for Public Service"
16. Royal Father of the Year"
17. Ekiti Future Award Hero of the Year"
18. OAP (On Air Personality) of the Year"
19. Media House of the Year (This include TV & Radio Station)"
20. Award Prize for Advocacy"
21. Teacher of the Year"
22. Award Prize for Agriculture"
23. Woman of the Year"
The nomination process will run for 3 weeks after which nominees will be shortlisted for voting. We are using this medium to reach out to potential sponsors and partners to let’s make the event a memorable one. For Sponsorships, partnership and enquiries, you can call: 07032537109 or 07085835448 Email: hello@efusa.com.ng.